A major fire raced through a marina in the Miami district of Coconut Grove, Florida, reducing four yachts to charred hulls. While no people were seriously injured in the blaze, the Grove Harbour Marina fire is estimated to have caused up to $7 million in property damages. Capt. Rand Pratt, owner of Sea Tow Key Biscayne, worked round-the-clock along with local firefighters, the U.S. Coast Guard and fellow Captains from four different Sea Tow locations to help fight the fire and clean up the marina in its aftermath. “It was a real tragedy what happened to these beautiful yachts,” said Capt. Pratt. While there has been no determination of the cause of the Grove Harbour Marina yacht fire to date (an investigation is ongoing), he said this incident should remind all boaters to review and rehearse their fire-prevention practices. Most boat fires are caused by fueling or electrical issues. Make sure you have the proper size and type of marine fire extinguishers for your boat. Depending on the size of your boat, you may need more than one fire extinguisher. The U.S. Coast Guard Federal Requirements are available online at BoatSafe.com. Mount the fire extinguisher in an easily accessible location so you can get to it in an emergency. Inspect your fire extinguishers regularly to make sure they are fully charged. Before fueling, have all passengers leave the boat and shut off all flames (stoves, ovens, grills, etc.). Close all windows, doors and openings to prevent fumes from entering the boat. While fueling, keep the nozzle in contact with the tank to prevent sparks and do not overfill the tank, so you leave room for the fuel to expand. Do not smoke! Wipe up any spills and dispose of the rags. After fueling, open all the windows, doors and openings and run the exhaust blower for four minutes. Before starting the engine, perform a “sniff” test of the bilge and engine compartment. If you smell gas, continue to use the blower until all of the fumes are gone. To prevent electrical issues, inspect the electrical connections in your boat frequently. Also, inspect any shore power connection lines that you may be using before plugging them into your boat. If any wires are frayed or you see sparks, immediately shut off the power source and get the issue repaired before using it again. Be cautious when using heaters in enclosed spaces, especially when unattended. If a fire does break out on your boat, make sure everyone puts on a life jacket. If possible, position the boat so the fire is downwind. Turn off the engine and any other electrical equipment. NEVER use water on a gasoline, oil, grease or electrical fire. Get your fire extinguisher ready to use. Use the PASS method. Call for help on your VHF Radio or cell phone. Prepare to abandon ship. WASHINGTON — Secretary of the Interior Ken Salazar announced more than $7.5 million in competitive grants to 10 states for 11 projects to support recreational boating through the U.S. Fish and Wildlife Service’s Boating Infrastructure Grant program. The Service will also release approximately $2.5 million to 26 states, commonwealths, and territories willing to match a smaller, non-competitive grant program known as “BIG Tier 1” funding. Funding for the Boating Infrastructure Grant program comes from the Sport Fish Restoration and Boating Trust Fund, formerly known as the Aquatic Resources Trust Fund, which boaters and manufacturers support through excise and other taxes on certain fishing and boating equipment and boat fuel. Maybe there is such a thing as too much yacht. Roman Abramovich arrived in the French port of Antibes this week aboard his boat, Eclipse, which is the largest yacht in the world at more than 530 feet. The Russian billionaire and his girlfriend were apparently planning to stay at Mr. Ambramovich’s villa in town. Because I guess the boat’s 30 cabins, two swimming pools and disco hall proved a little confining. 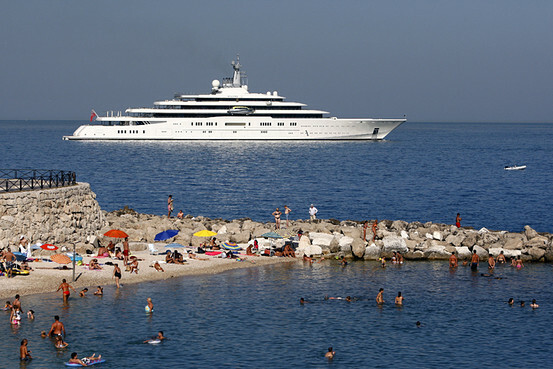 Abramovich had to suffer the indignity of docking offshore and taking one of the boat’s tenders in to shore. Bored in retirement, legendary aerospace engineer Burt Rutan is working on a new project, a high-speed winged boat that can double as a seaplane, so he can fly between lakes and rivers near his new home in Coeur d’Alene, a lakeside resort in northern Idaho. Famed for designing a series of innovative aircraft and spacecraft, Rutan began building planes of his own design in the late 1960s while working as a project engineer for the US Air Force. He founded Scaled Composites in Mojave, California in 1982, where he became famous for designing Voyager, the first plane to fly around the world without refuelling in 1986. More recently, Rutan designed a flying car, which got off the ground for the first time in July. However, his crowning achievement was SpaceShipOne, which in 2004 became the first privately funded craft to fly a human into space. A follow-on design, SpaceShipTwo, is intended to carry six space tourists to altitudes of about 120 kilometres, but so far has only glided in the air. But when Burt Rutan says “seaplane”, you know he’s not thinking of the propeller-powered pontoon planes that have been flown for decades. Instead, his plans draw inspiration from large wing Russian ships or “ekranoplans” built during the Cold War (see above). Essentially boats with wings and aircraft engines, they could rise up to 20 or 30 metres above the water. Rutan is thinking of a much smaller wing-boat that could reach high speeds in boat-mode on the water then take off and fly. It can handle road, sand, ice and even water – and won’t make a mark on the environment. The all-terrain vehicle, which has a top speed of 100km/h and works like a hovercraft, can move seamlessly between different surfaces. 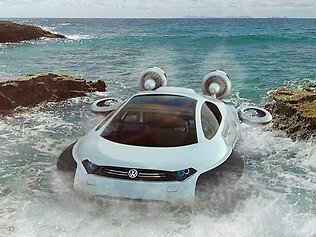 Chinese designer Yuhan Zhang, aged just 21, created the spectacular car – called the Volkswagen Aqua – for a competition sponsored by the German car manufacturer. It features a shiny, sleek design with four fans and integrated airbags that inflate to make the vehicle hover. It’s also totally environmentally friendly – its two motors are powered by a hydrogen fuel cell which boasts zero carbon emissions. One of the motors inflates a “skirt” around the vehicle to lift it off the ground, while the other drives it forward and controls the vehicle’s direction. The competition asked designers to come up with a “Chinese off-road vehicle”. Aqua is based on technology that is currently available.